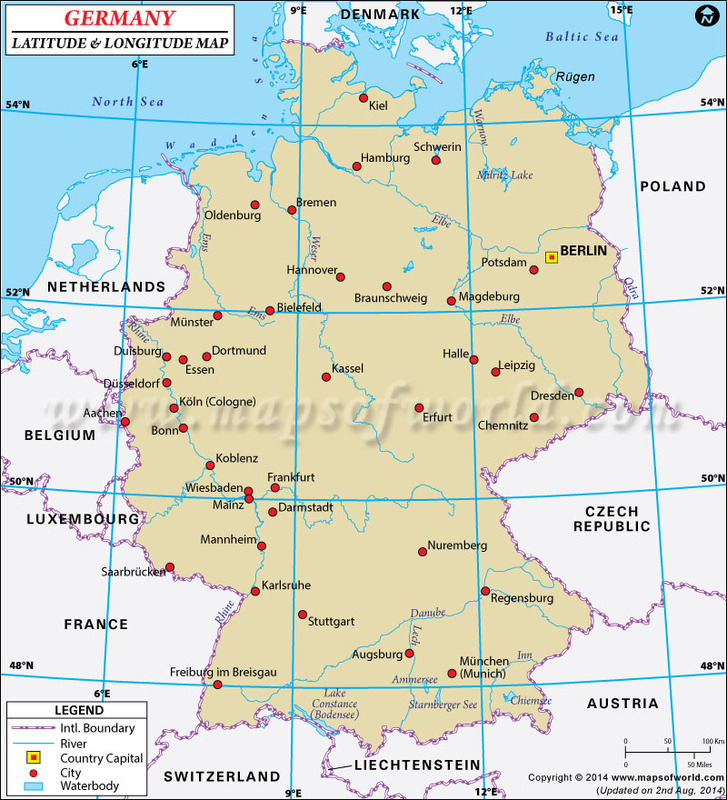 Germany's latitude and longitude is 51° 00' N and 09° 00' E . Below is the map of Germany showing major towns, roads, airports with latitudes and longitudes plotted on it. The Federal Republic of Germany (German: Deutschlandkarte) is located on the geographic coordinates of 51.5167°N Latitude and 9.9167° Longitude in Europe. The largest city and the capital of Germany is Berlin, with latitude of 5231'N and a longitude of 1324'E respectively. The extensive Latitude and Longitude of Germany covers an area of 357,021 sq km. Also known as the Bundeslander, Germany boasts of one of the largest economies in Europe and is also one of the most populous nations in the world with a population of 82,400,996. The population profile consists of a majority of Germans, and other races include the Turks, Greeks, Italians, Polish, Russian, Serbo-Croatian and even Spanish. Germany has a mixed terrain consisting of the fertile lands and mountainous areas. There are lowlands in the north, uplands in central Germany and the Bavarian Alps due south. The climate of Germany also varies from place to place. The inland areas have a temperate type of climate while the coastal areas have a distinct marine climate. Summers are generally warm and humid while winters are cooler. Summertime winds called the Foehn blow through the plains from the mountains.